I have been in e-mail conversation with our treasurer, Bob Johnston, about St. Paul’s’ parochial report. This is a report for The Episcopal Church that every parish fills out annually concerning its activities and its finances. Mostly, it is the source of statistics about our church, but it is also used for other purposes, such as computing our diocesan assessment, the money we pay to the diocese to support the diocese and the larger church. Because it was not obvious from the annual report where some of the financial information on the parochial report was coming from, I have been asking Bob for clarifications. He has been both patient and helpful, and I can only say that it is difficult to imagine a parish treasurer’s being any more forthcoming and cheerful than Bob has been. I now think I understand almost everything of a financial nature that appears in our parochial report. None of these numbers appears in the annual report, presumably because the amounts represent special collections, often in special envelopes, given directly to the recipients listed. I want to take note of these numbers because some parishioners chide us for our stinginess regarding outreach. Indeed, we spend no money on outreach from pledges and plate income. Parishioners should notice, however, that the Outreach Fund gave away $4,300 last year, mainly from fundraisers such as our fish fries. Likewise, ECW contributed nearly $13,000 in outreach to such organizations as ERD, Calvary Camp, and United Thank Offering. Without looking deeply for expenditures that might conceivably be construed as outreach, therefore, we can confidently say that we are giving away more than $30,000 to organizations doing outreach. Should we be devoting more money to outreach? Probably. But let’s give ourselves credit for the outreach we are doing. And next year, let’s make sure that all our outreach, even money we collect and immediately send off to organizations like ERD, is shown in our annual report. The idea of buying one of the houses adjacent to St. Paul’s has several times been considered by the Vestry. Obviously, the Vestry has not hitherto approved such a proposal. Probably what the church needs most is office space and storage space, and a nearby house could provide that. I have personally advocated such a purchase when nearby real estate has come on the market. I suspect the Vestry has not acted in these circumstances either because there was not a clear plan for what the church would do with a house or because it wasn’t obvious how to fund such a purchase. I am told that the church has been given five months to make an offer on the house in question. My suspicion is that the owners came to the church. Selling to St. Paul’s could be attractive in a bad real estate market, in which buyers might be hard to find. But is the purchase a good move for the church? It is difficult to see how. To begin with, stone houses in Mt. Lebanon do not come cheap. Whatever state the property is in—there is reason to believe the house is not in a good state of repair—it would need to be renovated to serve whatever role we assigned to it, and we would likely have to spend a good deal to bring it into code compliance as a public building by adding things like sprinklers. Even with a good deal of renovation, it is difficult to see how the building could be made handicapped accessible. It is a multi-story house whose entrance is a good deal higher than street level. We could easily spend half a million dollars and still not have a convenient or handicapped-accessible building. Even if we had half a million dollars in hand, this looks like a solution in search of a problem. Does Lou really not have a plan, or does he have a plan he is simply not telling us? (The latter seems more likely.) He told the staff meeting that half the parishes in The Episcopal Church have rectories. That may have once been true, but I doubt it is any more. The Church Pension Fund has long recommended against parish rectories, and many of those properties that have not been sold off are being occupied by renters unrelated to the parish landlords. I know a lot of local parishes that have sold their rectories but not many with existing rectories. Cynthia Bronson-Sweigert has moved out of Redeemer’s rectory, which she thought too small. 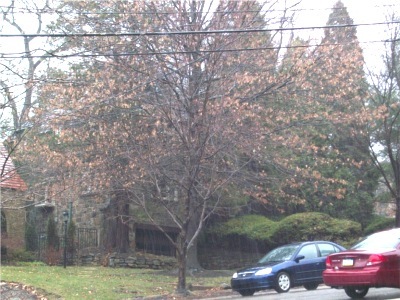 St. Andrew’s has converted its rectory into meeting space, though the upper floor is not in use because the parish did not have the money to bring it up to code. In any case, buying a nearby house may not be the only way for the parish to get more space. Some storage could be had off-site. We might even be able to build over the parking lot. Such alternatives should be considered along with the purchase of adjacent real estate. Are we, in fact, using the space we have effectively? Rather more disturbing is that Lou’s capital campaign, as we knew it would, is again rearing its ugly head. Surely, the real message from the Episcopal Church Foundation was that not only did the parish not like certain aspects of Fulfilling the Vision, but that the parish had issues that had to be dealt with before embarking on such a campaign. Whatever you may think of the emotional health of the parish, however, we appear to be unable to fully finance even our payroll, much less make necessary repairs to our building. (With all the rain, water has been leaking into the chapel, by the way.) Surely the building we already own needs to take precedence over renovation of a building we might buy. It is time for St. Paul’s to take a serious look at the state of the parish. The visioning we did a year and a half ago was a sham. Real engagement by the members of the parish is required. We need to start over, developing a realistic vision for the future—a vision owned by parishioners, not simply by the rector. 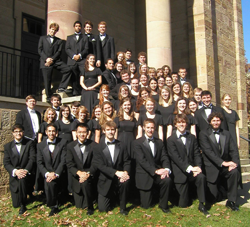 Actually, the concert by the Kenyon College Chamber Singers, under the direction of Benjamin Locke, was fabulous! If you missed it, you should be very regretful. It was a rainy night, however, and not only were the parking lot stripes that are supposed to define parking places impossible to discern—see “Parking Lot”—but the two lamps on the back of the building that are supposed to light the lot were unlit. (They were not on when I attended choir rehearsal on Thursday, either.) When I returned to my car after the concert, the parking lot was still dark, and it struck me as slightly dangerous trying to walk to my car through the traffic. I don’t know what’s wrong with the lamps for the parking lot, but, whatever it is, we had better take care of it before the darkness causes an accident. Alas, the concert was rather dark as well. No one seems to know how to use the lighting system in the church anymore. Not only didn’t we change the lighting before, during, and after the concert, but the side aisles were dark, and the spots that should have been on the chorus were off. It didn’t ruin the concert, but it would have been fun to be able to see the singers more clearly. By the way, the chorus sang everything a capella and without music. Very impressive! I am only a modest blogger who sometimes is guilty of overlooking the obvious. In my last post—see “Quantifying Outreach”—I stated that the 15% Outreach slice in the pie chart at the right represented St. Paul’s “mandatory outreach,” our diocesan assessment and payment to the Growth Fund. It was pointed out to me, however, that this is cannot the case. Assuming that the pie chart represents expenditures from the Operating Fund, the value of the two items mentioned is $69,624, whereas the total expenditures from the Operating Fund is $717,108. Thus, mandatory outreach represents roughly 10%, not 15% of the budget. What accounts for the other 5%? For the two expenses in question, one cannot even attribute building overhead; we don’t even need a building to pay our diocesan assessment. This is another interesting question for the treasurer. There is some distress in the congregation that St. Paul’s supports no outreach from its general funds. This is not to say that the parish does no outreach. Feeding people at Shepherd’s Heart doesn’t show up in our financial statement, for example, because the labor and food involved are contributed by parishioners directly. One cannot deny that this is serious outreach, however. Various fund raising events have resulted in donations to such organizations as Habitat for Humanity and the Greater Pittsburgh Food Bank. Parishioners also contribute money to organizations such as Episcopal Relief and Development and United Thank Offering. Alas, the pie chart that occasionally crops up in St. Paul’s publications only represents the Operating Fund. It shows that we give 15% of our money for outreach, but this is actually “mandatory outreach,” which is to say, no outreach at all. It is basically church overhead, being made up of our diocesan assessment and the payment to the Growth Fund needed to obtain loans from the fund. (See “Report from the Treasurer Q&A.”) Actual outreach in that pie chart should be shown as 0%. The complaint that our parish does little outreach got me thinking of what we do or have done or might do that could be construed as outreach. For example, we used to sell snacks to children after school. I don’t know if we made money on this enterprise, but we were certainly showing the flag and giving an opportunity for the kids to interact is meaningful ways with the staff. That, I think, was outreach. Other activities are not so clear. I have been inclined to consider events such as organ recitals as outreach, sharing our magnificent instrument and visiting organists with the community. I’m not so sure that this belongs in the same category as feeding the hungry, although it may address a certain spiritual need. Likewise, allowing outside groups—various support groups come immediately to mind—to use our building is outreach, although we don’t account for it as such. Arguably, this is just what churches do, but some churches clearly do more than others, and to call it outreach doesn’t seem to be too much of a stretch. Such considerations led me to ask a question I had not asked before. Certainly, worship services are not outreach in the sense that the church usually uses that term. What about a service like Refuge, however? Is it just another worship service, one of those things churches do? Or is it outreach to an under-served population, perhaps even to the unchurched? I don’t really have an answer to that question. Lou has emphasized that we have many services that address different tastes—I’m not sure that’s the word he would use—and Refuge, like the 8:45 service, is one item on the St. Paul’s worship menu. Most of the people who attend the Refuge service seem to be parishioners who see Refuge as offering a different worship experience at what for them is a convenient time. On the other hand, perhaps Refuge really does represent outreach. If it does, we can be excused from missing that fact, since we never really got a proposal for what the service was supposed to do or how its impact was to be evaluated. I find it difficult to distinguish Refuge from, say, the 8:45 service, as we marketed the services in much the same way, even though we spent more money on Refuge. But Refuge really is different, and, whether or not it is attracting a very different demographic from our other services, I think it is at least intended to do so. The question about Refuge is important because our parish—any parish, in fact—has to set priorities. Supposedly, when diocesan funds for Refuge run out, if Refuge is to continue, the parish will have to finance it 100%. At that point, if we see Refuge as just another worship service, no matter how innovative, we have to ask if we can really afford to have six weekend worship opportunities, some of which attract few worshipers. If we see Refuge as outreach, we have to ask if money on Refuge as outreach is well spent, or whether our limited outreach funds—presently $0, in fact—should go to supporting Refuge or to supporting the likes of Habitat for Humanity or the Greater Pittsburgh Food Bank.